Posted on December 9, 2010 by Akashic Love & Light! Located in the northern most area of Thailand is the culturally rich city of Chiang Mai. The city is a good base for those heading out on a variety of local tours. With a number of tour options available for visitors it can be hard to decide which ones are worth your time and money. You can bamboo raft down the Mekong River, catch an elephant show, ride an elephant through the mountains, or tour the area by ox-cart. Cultural tours to visit the hill tribe people are popular as well. There are seven different hill tribes residing in Thailand including the Karen, Lisu, Lahu, Hmong, Akha, and Mien tribes. On a recent trip to Chiang Mai, I visited an elephant camp, floated down the river on a bamboo raft and also rode an elephant! all of which was great fun, but the most fascinating component of the tour was the visit to the Karen Long-Neck Tribe. I found out that the Karen Padaung Hill Tribe people are political refugees that fled Burma in the late 80’s and 90’s and were granted asylum in a number of areas of Thailand. Little villages such as the one depicted in the photo above are located in many areas of Thailand, including Chiang Mai. The women in the the Karen Paduang tribe are called “Long-Neck” because they wear brass coils around their necks; a traditional practice among the tribe dating back long before their arrival in Thailand. The coils serve a decorative purpose and give the illusion of elongating the neck, when it in fact it actually pushes the collar bone down. Children as young as five are fitted for their decorative coils starting out with one or two brass links, each year adding one or two rings. There has been a steady decline in recent years among the younger women in Burma wearing the coils for both health and social reasons. However, in Thailand there has been a resurgence of this traditional practice, possibly due to the need to generate tourism dollars for the tribe. Keep in mind, visiting any of these villages will not give one much insight into the cultural practices of the tribe. The village is set up mainly as a tourist attraction to help generate money and work for the tribes people. The “village” section that is open to the public consists of rows of stalls selling colorful scarves, purses, clothing and traditional looking handicrafts. The women were friendly and wore beautiful traditional clothing. I had mixed feelings about visiting the the village but it’s apparent that tourism is their main source of a much needed income. Because they are political refugees they are not eligible to attain citizenship in Thailand. Therefore, they do not have the same access to medical care, education, or legal employment as do the citizens of Thailand. The majority of their income is dependant on tourism. A donation box is located at the entrance of the village where you can leave money to help contribute to education and medical necessities for the village. 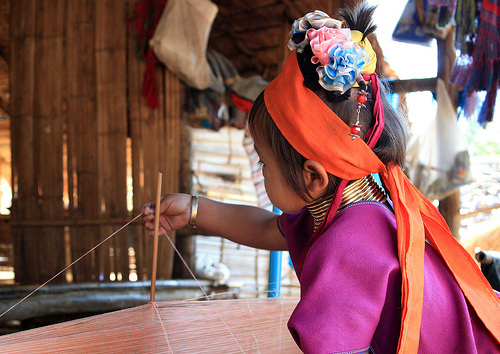 A visit to the Karen Tribe is usually part of a longer day tour, usually combined with an elephant trek, the elephant show, a ride on an ox-cart or bamboo rafting down the Mekong river. The tours are a great way to see a lot of Chiang Mai in a short amount of time and also a way to help funnel money to people who need it. An interesting day to say the least! This entry was posted in asia and tagged Akha people, Burma, Chiangmai, Hill Tribe, Karen, karen tribe, long neck karen tribe asia, Mekong, thailand, travel, Women in Burma. Bookmark the permalink. © Christine Zenino. Please contact the author to obtain permission for republication.